Don’t we all wish we could spend our time at work playing games? Could you imagine going into your weekly status meeting, sitting down, and annihilating all of your co-working in your own corporate DOOM dungeon? Gamification is the application of game-design elements and game principles in non-game contexts. Gamification commonly employs game design elements which are used in so called non-game contexts in attempts to improve user engagement, organizational productivity, flow, learning, employee recruitment and evaluation, ease of use and usefulness of systems, physical exercise, traffic violations, and voter apathy, among others. A review of research on gamification shows that a majority of studies on gamification find positive effects from gamification. To us gamifcation basically means working while having so much fun.. it doesn’t feel like work ! In order to fulfill our ultimate desire to has fun at work we started looking into how to truely add gaming capabilities to an SAP process. We have been spending quite a bit of time working with customers to build enhanced UIs on top of AP Approval processes, so we figure we would give that process as shot. 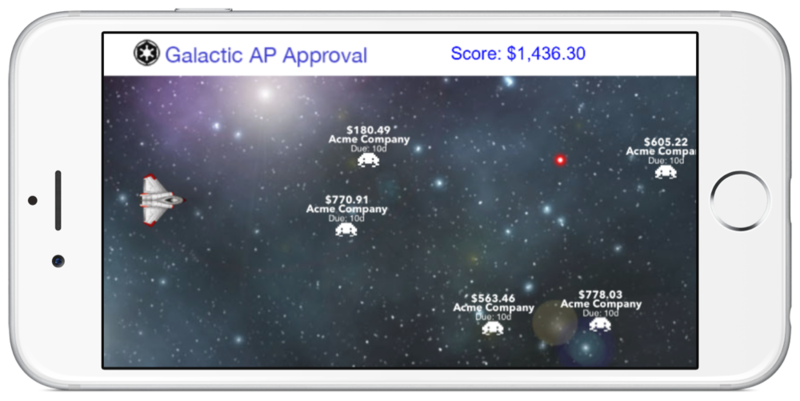 Here is a screenshot of the our ‘Galactic Inbox for SAP’ mobile game running on an iOS device. The premise is pretty simple. You are the hero in the star fighter on the left hand side of the screen. You need to shoot down the nasty payables disguised as aliens flying at you from the right. Tapping on the screen shoots a powerful laser which ‘approves’ the invoices when they are hit. In real life, this might not be the best use case. For it to make sense there needs to be a large number of low dollar amount invoices which need approval without any research. If there is a need to actually search the items, this might not make sense. Technically, the application is written in Apple’s SWIFT development language and utilizes the Sprite Kit framework. There is an immense about of helpful hints on utilizing SWIFT and Sprite Kit, we recommend everyone interested to go out and give it a try! This is a native mobile application and needs to be high performing. So we load of the approval objects (via a simple ODATA call ) when the application loads. The approvals are transported back the the SAP system once the game is over. Here is a video demonstration of the mobile game. If you would like more information, a demo of the mobile game or would like us to help you with your project, please contact us.